Great prices and fast shipping. I placed an order Saturday and the package was at my door when I got home from work tonight. (Tuesday) Thanks Al Bahr.. I've been shopping here for a while now and John with his staff is doing an excellent job. The stuff comes in about one week from order to Sweden Great job you all, I can definitely recommend FS Reloading Greetings / afk.. The Lee Precision .45 ACP (Automatic Colt Pistol) Deluxe Pistol 4-Die Set combines the world's most popular Carbide Three-die Set with the Lee Factory Crimp Die at a great price. 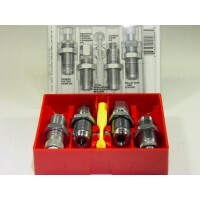 This Lee Carbide 4-die set includes Lee's Carbide Full Length Sizing Die which has a hard diamond polished surface that eliminates the need for lubrication and will never wear out. The decapper clamp collet accurately centers the decapper in the die. 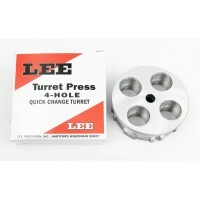 The Bullet Seating Die works with the Lee Automatic Bullet Feeder. It has a 45 degree chamfer to allow for the mechanical feed fingers and improved operator clearance. Also included, the Powder Through Expanding Die charges the case while expanding the case mouth. 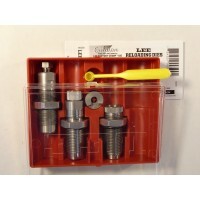 By separating the seating and crimping operation, Lee's Deluxe Pistol 4-Die Set provides greatly simplified adjustment. But more importantly, the Carbide Factory Crimp Die post sizes your cases thus assuring every round will chamber properly in your gun an absolute must if you reload cases that have been fired in other guns or for use in multiple guns. This, plus all the other exclusive Lee features, make this one of the best die sets money can buy. Lee Precision Carbide Dies DO NOT require case lubrication. Additional load data is available in Lee's Modern Reloading 2nd Edition and Barnes Reloading Manual 4th Edition. The Lee Precision .45 Colt (Long Colt) Deluxe Pistol 4-Die Set combines the world's most popular Ca.. 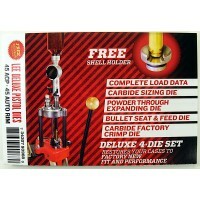 The Lee Precision .40 Smith & Wesson Deluxe Pistol 4-Die Set combines the world's most popular Carbi.. 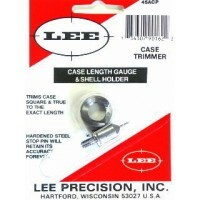 This Lee Precision Case Length Gauge is the easiest way to trim .45 ACP (Automatic Colt Pistol) ca.. 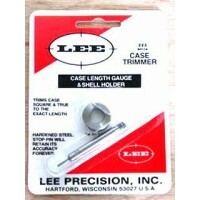 This Lee Precision Case Length Gauge is the easiest way to trim .223 Remington cases to the proper ..